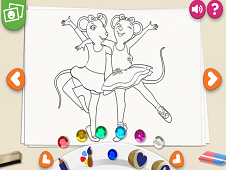 "Angelina ballerina" is a series of books of story for children. 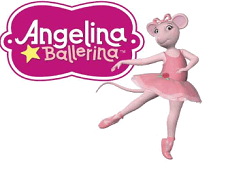 Name of Angelina ballerina comes from the protagonist of this story, which is a mouse. First book in this series was published in the year 1983, after which they were also published over 20 books in the same series. The character story was created by Katharine Holabird and illustrated by Helen Craig. Because the story was loved by all the children in the year 2001 appeared the first cartoon character with Angelina ballerina. Drawing a lasted for 40 minutes, being just an episode in series which was to be broadcast on channels intended for childrens. For this reason new Angelina ballerina games are now on friv-games, hoping that they will have as much success as the story. Our little mouse, which is main character appears always dressed in ballet dresses, due to the fact that she likes it very much to dance. Angelina is a mouse very nice and very talented. Because she couldn`t learn to dance alone, Angelina has a professor of dance, named Miss Lilly. This is always in the drawing, in a picture that Angelina has in her new school of dance. In this story, all characters are students in the school of dance, they all are colleagues with Angelina. In order they are William Longtail, the twins sisters Priscilla and Penelope Pinkpaws, Felicity, Flora and Sammy Watts. Alice Bridgette is the best friend of Angelina and she is a true talent in the history of gymnastics. Among characters include the family of Angelina, which consists of her parents, Mr. Maurice Mouseling and Mrs. Mathilde Mouseling. Her sister's name is Polly Mouseling and she is a mouse with white fur. In the story may appear sometimes Angelina`s grandparents, Sophia and Jeffrey Mouseling. Another characters are her uncle and her cousin, named Louis Mouseling and Henry Mouseling. As in any story, we have here a character who is always grampy and this is the neighbor of Angelina, Mrs. Harriet Hodgepodge. In this story we have the doctor Tuttle, the only one in town, pianist MS. Quaver which sings at the hours of ballet, and other teachers of ballet that come and go along story. 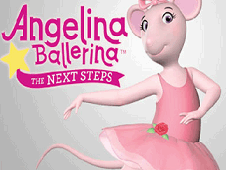 Angelina ballerina is a story about a world of mice, which, learn to dance, however, the most talented is Angelina. A story full of humor and good mood, a pretty story, with music and dance which is you need to read and to watch. All of these things you will encounter in Angelina ballerina games, where you will have the opportunity to establish the characters. In the new games with Angelina you will have the opportunity to dance with with Angelina and met her school of ballet. You're going to spend time with one of the most agreeable mice, in a world full of good mood. Perhaps you'll even learn to dance in the same way as Angelina and you will discover a new talent. The friv-games.com team hope that you will have a lot of fun and if you decide that you don't like the games proposed by us, please let us know. 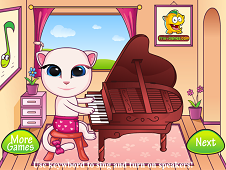 In the event that you find other Angelina Ballerina games on which we do not have published please tell us immediately and we will do all the best. YOU KNOW THIS ABOUT Angelina Ballerina Games? 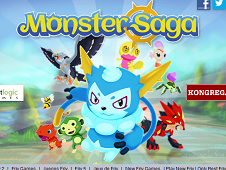 In Angelina Ballerina Games page you can find 9 games that we've published for these kids and children that are interested to play Angelina Ballerina Games, this game category have been created on 16.03.2015. These games with Angelina Ballerina Games have been voted a lot of times and we are inviting you to let a comment after each of this game.